Mars’ moons may not look like they were made of the same stuff as the planet. But they are, a new study postulates, based on new analysis of old data. The bizarrely dark and misshapen moonlets Phobos and Deimos were thought to have been created by gravity capturing passing asteroids. Not so, says new hypothesis, contradicting the accepted wisdom: they were formed from a catastrophic collision. Early in the formation of the solar system, a passing celestial object slammed into Mars and kicked up chunks of volcanic crust into outer space, suggest scientists at the American Geophysical Union, in a paper published Monday in the prestigious Journal of Geophysical Research – Planets. One reason science hadn’t thought Phobos and Deimos grew from scratch, like the major planets, is that neither has that spherical shape so familiar from other planets and moons (such as our own). But science also didn’t think the two moonlets had formed from the same rock as the parent planet: In visible light, Phobos and Deimos look much darker than Mars. Hence the assumption that they were captured asteroids. Mark that key phrase: in visible light. 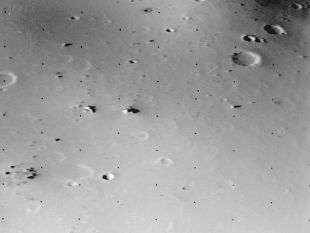 Though they were named for the twin sons of Ares, the Roman god of war – Deimos means flight and Phobos means fear – neither seems terribly impressive. Phobos looks like nothing so much as a potato shot with a BB gun (creating the craters). First discovered in 1877, once scientists got a good look at the thing they decided it had to be a captured asteroid. The same opinion developed regarding Deimos, which also looks like a pocked spud, but with a bite missing. Both are tiny, by celestial standards. Earth’s diameter is about 12,750 kilometers (7,900 miles). Mars’ is nearly 6,800 kilometers. Phobos is just over 11 kilometers in diameter and Deimos 12 kilometers. But the moons’ orbital dynamics did not comply with the capture scenario, neither in shape nor in angles. “If you talk to the people who are really good at orbital dynamics and figuring out why certain bodies orbit the way they do, they say that, given the inclination and the details of Phobos’ orbit, it’s almost impossible that it was captured. So you have the spectroscopists saying one thing and the dynamicists saying something else,” explains lead author Timothy Glotch, a geoscientist at Stony Brook University. Some asteroids (“D-class”) are nearly black because they’re heavy with carbon, like coal. The two moons’ sheer ebon quality spurred the hypothesis that they were simply captive asteroids. 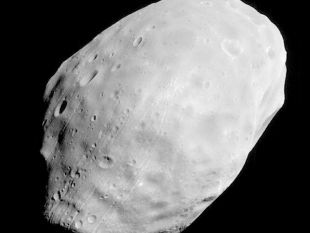 In visible and near-infrared light, Phobos and D-class asteroids are practically featureless – no spectrum because they are so dark. Mid-infrared is another story. In 1998, the heat signature from Phobos was measured by the Mars Global Surveyor. 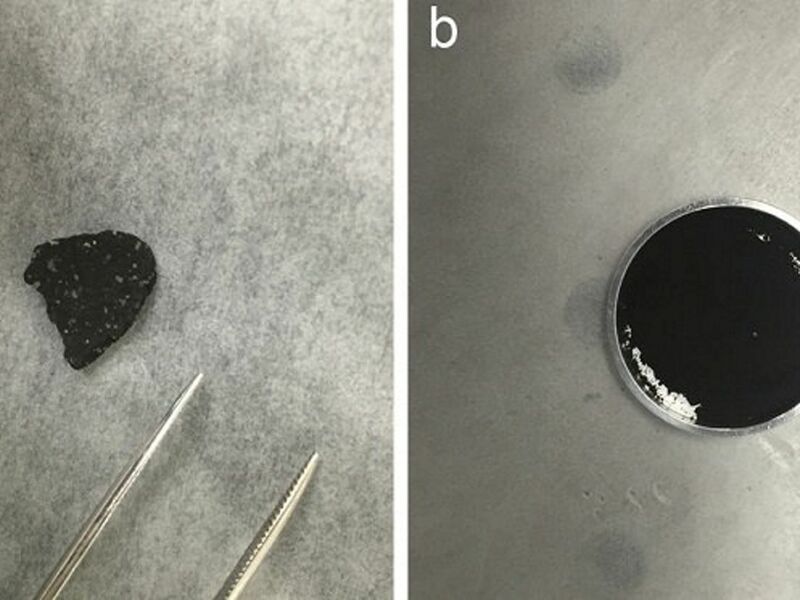 Now, Glotch and students compared Phobos’ heat signal samples of a meteorite found in Tagish Lake, Canada, which some scientists think is a piece of D-class asteroid. The bottom line was that Phobos’ heat signal was nothing like the Tagish meteorite, but was very much like the signal of pulverized basalt. 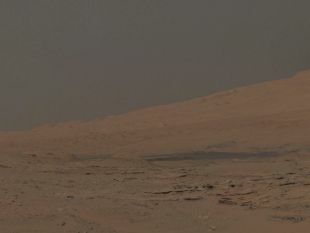 And that is what the Martian crust is made of, mostly. 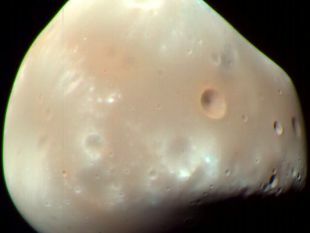 “That leads us to believe that perhaps Phobos might be a remnant of an impact that occurred early on in Martian history,” Glotch says. Ta da! Or maybe Phobos and Deimos were made of Martian crust kicked up into space by a violent impact that collided with celestial objects – and the rest is Martian history. One caveat, courtesy of Fries again: The Tagish Lake meteorite is unusual, so perhaps not a great object for comparison. Also, who knows how existing for billions of years in outer space has affected Phobos’ reflectance spectrum. The moonlet could have picked up the cosmic equivalent of coal dust. So did Deimos and Phobos originate in violent celestial crashes that kicked basaltic Martian crust into outer space? We should all know soon thanks to probes sent to asteroids. Glotch points out that Japan is developing a mission called MMX, aiming to collect samples from Phobos, no less. Why is it useful to know the origin of Mars’ moons? It isn’t. But it's nice to know anyway.